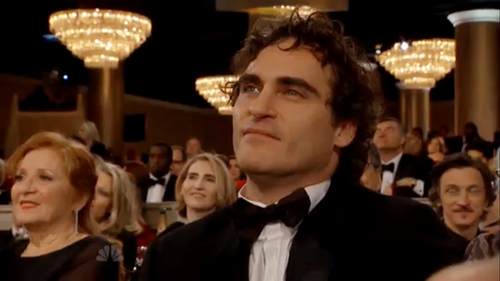 Joaquin was not nominated at the SAG Awards, but was quoted by actor Daniel Day Lewis, who won the best actor award. Joaquin Phoenix is in talks to reteam with Paul Thomas Anderson for Inherent Vice, an adaptation of the 2009 Thomas Pynchon novel. Megan Ellison’s Annapurna Pictures is financing the movie, which will be produced by Anderson — who directed Phoenix in last year’s The Master — Ellison, John Lesher and JoAnne Sellar. Anderson wrote the screenplay based on the novel, which is set in 1969-70 Los Angeles and centers on a pot-smoking detective on a kidnapping case. The book featured a slew of characters with quirky, original names — from Shasta Fay Hepworth and Riggs Warbling to Japonica Fenway and Adrian Prussia. Picking up an award from the London Critics’ Circle for Best Actor, Phoenix released a statement expressing both his great thanks, and also a little disbelief that he bested Daniel Day-Lewis. Joaquin unfortunately didn’t win the award for best actor drama at the Golden Globes yesterday. The winner was Daniel Day-Lewis (“Lincoln”). Amy Adams and Philip Seymour Hoffman also not won in the categories they were nominated for “The Master”. Joaquin Phoenix did not walk the carpet so there are no photos of him. Paul Thomas Anderson won Best Director for “The Master”. Joaquin Phoenix won Best Actor for “The Master”. Amy Adams won for Best Supporting Actress for “The Master”. In the same night Joaquin and Amy Adams attended the celebration of the Weinstein Company for the Golden Globe nominations. Joaquin attended the Critics’ Choice Movie Awards on the evening of Thursday (10) in Santa Monica, California. Added to the gallery the first pictures released. Joaquin was nominated for best actor but lost the award to Daniel Day-Lewis (“Lincoln”). Philip Seymour Hoffman won for best supporting actor (“The Master”). The complete list of winners you can check out here! Joaquin had his third Oscar nomination. The nominees were announced on the morning of Thursday (10). Ceremony takes place on February 24 in Los Angeles. “Lincoln” is leading the way to the 2013 Oscars. This morning, the biopic about the 16th president picked up 12 Academy Award nominations, including best director for Steven Spielberg and best actor for Daniel Day-Lewis. Joaquin Phoenix was spotted leaving Whole Foods after doing some grocery shopping in Los Angeles, January 4. The Toronto Film Critics Association has picked Joaquin Phoenix‘s new drama The Master as the best film of 2012. The movie has won the Canadian organisation’strophies for best film and best screenplay, while Paul Thomas Anderson was named best director and Philip Seymour Hoffman was hailed as bestsupporting actor. The Master saw off competition from French drama Amour, which was named the year’s top foreign-language film. Michael Haneke’s Amourpreviously beat The Master to the top prizebestowed by the Los Angeles Film Critics Association. Denis Lavant won best actor for his role in Holy Motors and Rachel Weisz took best actress for her performance in The Deep Blue Sea, while Gina Gershon was voted best supporting actress for her turn in Killer Joe, and ParaNorman was named 2012’s best animated feature. The prizes will be handed out at a gala in Toronto on 8 January. The Los Angeles Film Critics has announced its award winners for the 2012 film season! Amour, which focuses on an elderly couple whose love is tested after one is paralyzed from a stroke, picked up Best Picture, while Paul Thomas Andersonwas named Best Director for The Master. Jennifer Lawrence tied with Emmanuelle Riva for Best Actress for her work in Silver Linings Playbookwhile Joaquin Phoenix was awarded Best Actor for The Master. His co-starAmy Adams won the prize for Best Supporting Actress and Dwight Henrywas the recipient of Best Supporting Actor for his role in Beasts of the Southern Wild.